I put my HS Coloring and Activity Book thread in the "Other Customizations" forum. This is where that should have gone so that is where this will go. You can check out the first HS Coloring and Activity Book. My kids had such a good time with my first endeavor that we have been doing HS themed Halloween activities. I decided to put some of them together for fellow 'scapers. I have a great burden for fathers to take up the mantle of being "Daddies" to their children. To often we fall into the trap of thinking that "stuff" we give our kids is a suitable replacement for giving them ourselves. Kudos to those of you who take your extremely important role of daddy seriously. I hope that maybe some of the things in this "book" will help you spend some quality time with your kids when you can't break out the 'scape with them. 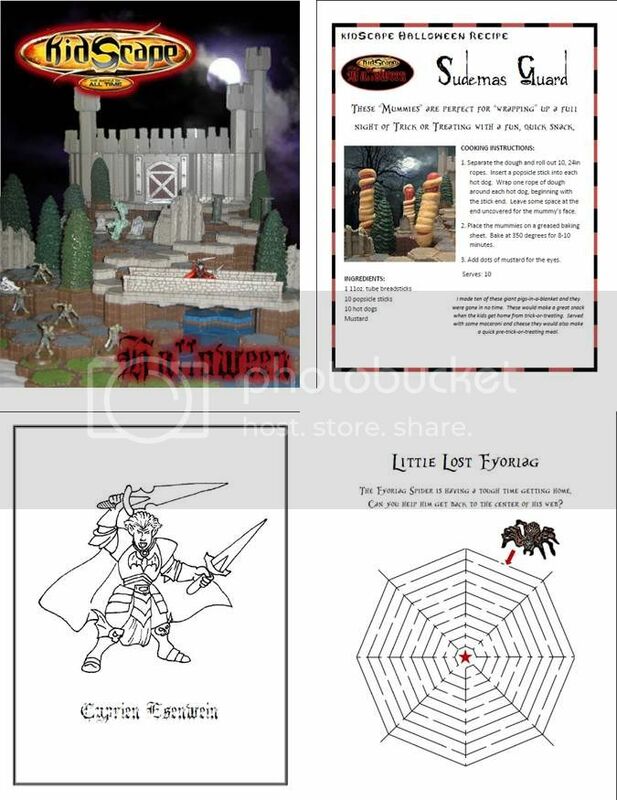 This issue (if other issues follow) is packed with HS based coloring pages, activities, crafts, games, recipes, a scenario, and a custom card all themed for Halloween. I hope you and your family have as much fun with it as mine did. Last edited by Lamaclown; July 19th, 2012 at 04:28 PM. It is a mixture of both original material and stuff I have picked up along the way. The games are all original as are the mazes. The recipes are just things I have picked up along the way. I hope you and your friends enjoy the worms and popcorn! I still get a kick out of the worms and the zombie fingers (I have to admit though that my wife did most of the work on the zombie fingers). BTW, I took your suggestion from my HS Coloring and Activity Book and there is a "solution" section at the back of this book- thanks. GREAT IDEA! I might give them out for Halloween with the candy this year. Good way to advertise Heroscape and recruit the newer generation. We live in a condo so we don't get more than 10-15 kids each year trick or treating. "Desre for good grammar makes one looking to destroy fun??" I love it when the overly critical can't meet their own expectations. Well don,e man. Well done. That's all that needs to be said. Words cannot describe its impressiveness. "People of Gotham! Take control.... take control of your city! THIS.... this is the instrument, of your liberation...."
Great stuff Lamaclown! Though I can't enjoy this with my kids this Halloween(largely because I don't have any ), I still think this series of KidScape books is great. Thanks for the kind and encouraging words everyone. That is an awesome idea, delphic! I hope you are able to do it. With that in mind, I added one more page to the end of the book. It basically leads people to 'scapers.com for more info about the game. I don't know why I didn't think of putting it in there before. Just a few more days til Halloween. Just a few more days to try some of the fun thigs in kidScape. Great job! I wish I had made this. I guess I will go ahead and consider doing a second issue of kidScape. There hasn't been much verbal interest but there have been enough dloads to consider it. What would you like to see more of in the second issue: Games/activities, coloring pages, recipes, crafts, maps/scenarios, custom cards? I have a few ideas for a theme for the second issue but wanted to get your opinions on it. Any ideas you have will be greatly appreciated. Thanks in advance.